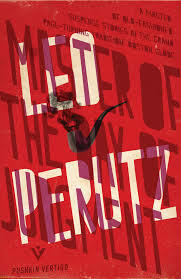 This month Pushkin Press launch a crime imprint, Vertigo. The initial titles include Vertigo (of course) by Pierre Boileau and Thomas Narcejac, The Tokyo Zodiac Murders by Soji Shimada, The Disappearance of Signora Giulia by Piero Chiara, and The Master of the Day of Judgement by Leo Perutz. Perutz was last revived in the UK by Harvill in the 1990s and seems a perfect fit for Pushkin. Yet another product of the Austro-Hungarian writing factory (he was born in Prague and lived much of his life in Vienna), he was a contemporary of Kafka and Stefan Zweig who wrote his first novel (the still untranslated The Third Bullet) while recovering from a wound received in the First World War. 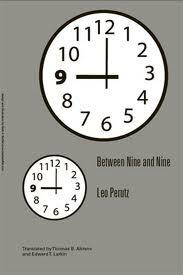 Nine of his eleven novels have made into English, however, most recently a new translation of Between Nine and Nine, a novel which takes place over twelve hours, and which I like to think of as the precursor of 24. (According to the Afterword, this was also written as Perutz recuperated from a war wound – as this was two year later, presumably a different injury). It is not the Baron, but a young engineer, Solgrub, who protests that Yosch is innocent and undertakes to investigate Bischoff’s death. One of the novel’s most entertaining features is the way Perutz uses Solgrub as the ‘detective’ hero while retaining Yosch as the narrator. At times Yosch follows Solgrub’s lead; on other occasions he strikes out on his own, pursuing some clue he has dredged from his memory, only to find Solgrub waiting for him. (It is rather like the Holmes / Watson dynamic, though as Solgrub is a stranger to the Baron before that night, and his social inferior, he is far less trusting). This allows the narrative plenty of twists and turns, as it is driven forward by the tension created by Yosch’s countdown towards an honourable death (at one point Felix appears with the promised letter) and the threat of a murderer who can compel his victims to kill themselves. Perutz provides the novel with a conclusion that is both fantastical and plausible, one which draws on the horror genre without recourse to the supernatural. He does not forget his characters, however, the final lines focusing on Yosch and Dina, before an Editor’s Postscript casts further doubt on what we have read. Perutz is a wonderful addition to Pushkin’s list of forgotten writers; The Master of the Day of Judgement an exciting beginning for Vertigo. You are currently browsing the archives for the Leo Perutz category.